Adapted from a 1951 hit Broadway play, The Four Poster (1952), starring Rex Harrison and Lilli Palmer, is a wistful tale of a 35-year marriage. The two-character movie—three if you count the ever-present double bed—is played out in eight bedchamber encounters, each bridged by a cartoon sequence created by animators at United Productions of America. Producer Stanley Kramer again called on Tiomkin to provide an overture that he hoped, along with the gaily animated cartoons bridging the time gaps, would draw attention away from what the producer called ‘the localised talk, talk, talk between one man and one woman [which] quickly becomes monotonous, then suffocating’. 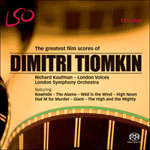 Tiomkin succeeded in delivering what one reviewer described as ‘a bright and energetic overture [that] captures all the chaos, joy and love of newly wedded marital bliss’. When Ned Washington added lyrics, The Four Poster theme became the song ‘If you’re in love’.